Sift flour and turmeric powder into a mixing bowl. Using a whisk, mix in salt, water, coconut milk and eggs gradually. Sieve into a clean bowl and cover to rest for 30 minutes before using. Heat a griddle pan, lightly grease with some cooking oil, stir batter and pour batter into roti jala mould. Moving the cup in concentric circles, make lacy patterns on the medium hot pan. Flip over once and remove from pan. Repeat the process until all batter is used. 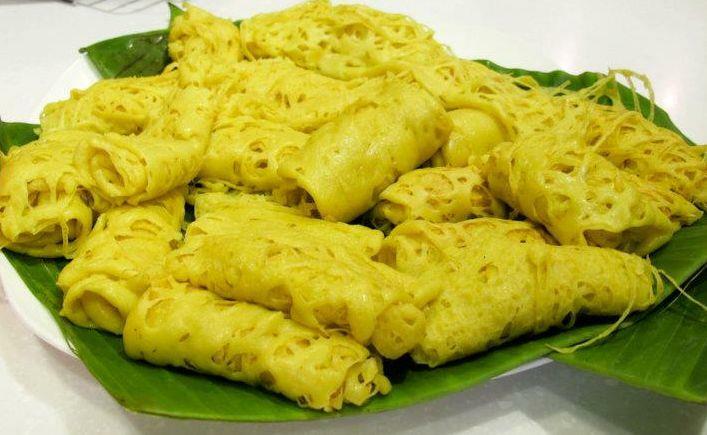 Roll up the roti jala into a swiss roll-like parcel and place onto a plate covered with tea towel to prevent drying. Serve with curry of your choice. BESIDE COCONUT MILK CAN WE USE FRESH MILK? Yes, you can substitute coconut milk with fresh milk or evaporated creamer/milk but it’s still best with coconut milk.